A huge thank you to everyone who voted for us on 6th May. 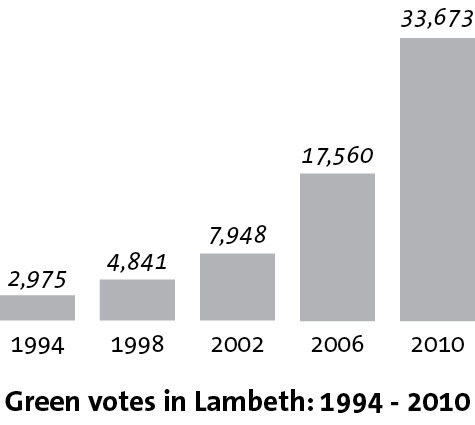 You helped us almost double our vote across the borough - up from 17,560 in 2006 to 33,673 in 2010. 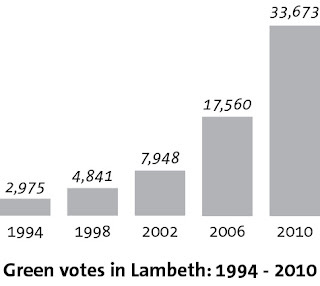 This is a major achievement and shows what many of us already knew - that these days the Green Party is a serious presence in Lambeth. Under a proportional voting system we would have gained 6 councillors and held the balance of power in the Council. However, it certainly wasn't all good news for us. The local election coincided with the General Election and a massive swing to Labour (they won 44% of the vote and gained 70% of the seats on the Council). We lost our one Green councillor and failed to win any more seats. We also need to recognise that, despite everything (growing inequality, record rent rises, spiralling social care costs, persistent unemployment) Labour still has very strong residual support in this area. We need to get better at communicating with these people, and persuading them that it is Green councillors who will champion their interests and values most strongly. Losing our councillor in Herne Hill is a big blow. Becca Thackray - who for the last 4 years has been the one Green Party member on Lambeth Council - has given a fantastic demonstration of what Green councillors can bring to an area. She has worked incredibly hard for her constituents on all sorts of issues, while also bringing major changes at the Council level, including commitments to reduce carbon emissions, pay a London Living Wage to all staff and give local people a say in how planning money is spent in their area. She deserves enormous thanks. The other major group to thank are all the volunteers who helped us in our campaign this year. We were joined by so many inspired and creative people who, like us, hoped to achieve something special in this area. I hope all the foot-slogging and hard work hasn't put anyone off! And that all our election volunteers will stay with us as we continue our campaign for a greener, more just and more inclusive Lambeth.